There are several and varied soldering and construction tasks you must be able to do correctly in order to pass this unit. See the latest assessment guidelines and check with your teacher. The first topics in this unit are tinning multi strand copper wire and joining copper wires and using heat shrink to correctly insulate a soldered join in two wires. The Video 1 is for the tinning process and the video 2 is for the joining process. Below is the first printed circuit board project, Vero board with a resistor string, one jumper, 4 track cuts. 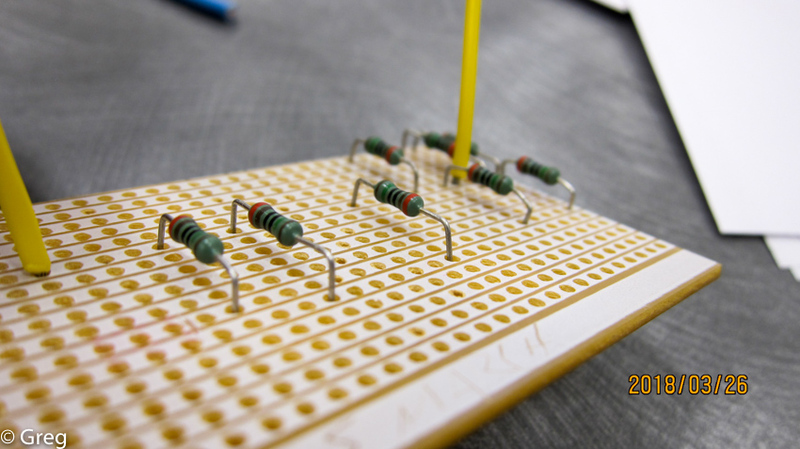 Your teacher will allocate the resistor values and you will prove correctness by measuring circuit with an Ω meter after soldering parts in. 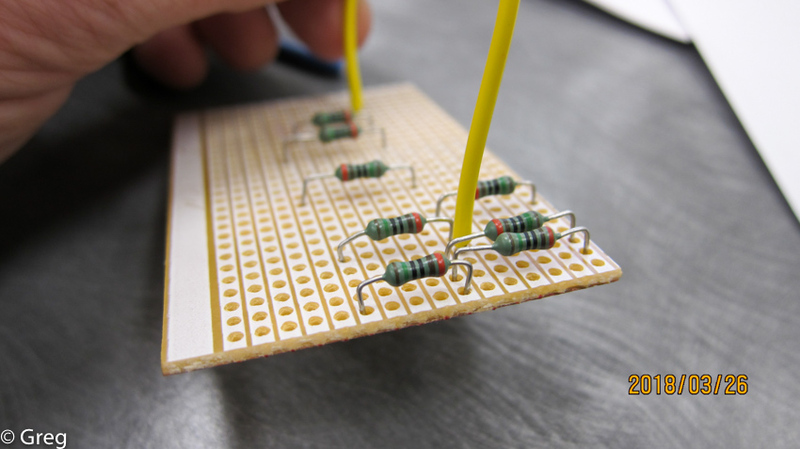 Note stress relief on resistors and 90° bends done with small pliers. The notes down this page show the use of a Dremel tool for track cutting but in practice with Vero board we generally use a 3mm sharp drill bit twisted by the fingers. 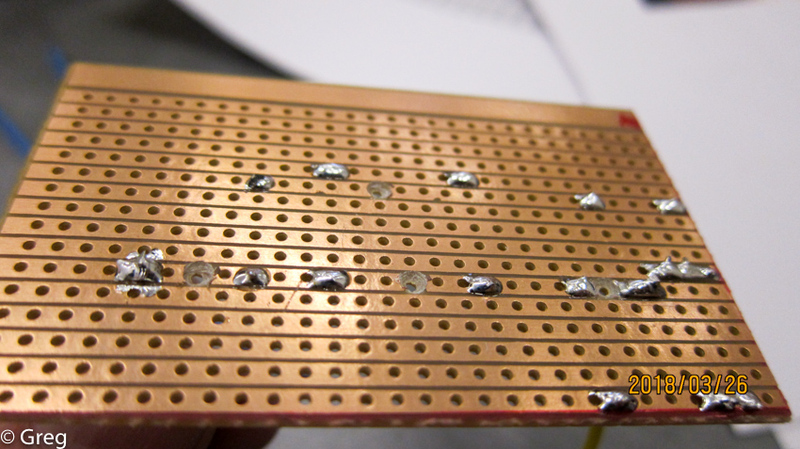 These solder joints could be much better! 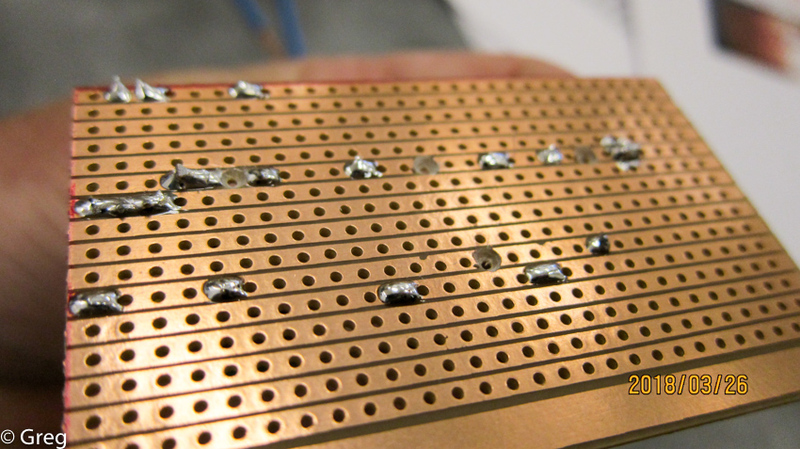 There is excess solder here, shown by the convex angle of the solder. One joint I had demonstrated to the student, it’s near the bottom left of the board adjacent to the cut. In this other photo you can see again, the joints are not shiny (lead -Pb- precipitation) from too cold an iron or going back into the joints or insufficient flux.